A reporter interviewed me recently about what people can do to end their obsession with food. "Do you still binge?" she asked. "Does your weight vacillate from season to season?" "No again," I said. "I've been at my natural weight for a few decades." "So let me see if I've got this right," she said, with the teeniest bit of suspicion. "You had a major weight problem for 17 years, you gained and lost a thousand pounds, and out of everyone who suffers from this crazy weight problem, you've managed to beat it?" "Yes," I told her, "I have." "But how? I mean, every woman I know struggles with her weight. It's just you and me here; tell me the truth: What is your secret?" I was about to launch into my standard answers ("I was so desperate that I was willing to try anything"; "I ate when I was hungry and stopped when my body had had enough", "I can't really explain it") when I realized something I'd sort of forgotten for most of the past 30 years: I'd worked hard at it until my relationship with food and with my body had totally changed. Usually when I talk about the many ways to end the struggle with food, I give a set of intuitive eating guidelines and describe the importance of treating yourself with compassion and kindness. And although both elements are very important, the truth is that no change will happen without consistent effort over time. A wise mentor of mine says that change isn't an event, it's a process. As you develop new ways of being with food, they eventually replace the old ways. It doesn't happen all at once. I received a letter last week from a woman who wrote. "Reading your book When Food Is Love, I felt as if I'd discovered the secret to happiness. I realized I could eat when I was hungry, stop when I was full, and let myself feel my feelings without turning to food. I lost 10 pounds almost immediately. Then somehow I got busy — I was promoted and moved to another city — and within a short time, I fell back into my old ways of using food to comfort myself. I am writing to you now because I feel totally hopeless. I can't believe I drove right back into compulsive eating again after feeling so happy (and so thin!). I've gained back the weight I lost (and more), and I eat in the car, at my desk, and at night after the kids go to sleep. Also, if I am to be totally honest, the thought of doing your program again files me with dread because it forces me to pay close attention to my body and food. I just want the whole thing to go away. Please, can you help?" Take the next step: Remember that the more time you spend ignoring the food-and-weight problem, wishing and hoping for it to just go away, the less time you spend developing new attitudes, behaviors and habits that will change it. Decide whether you'd rather keep lamenting your relationship with food or create a new way of eating. And then decide what you're going to do about it. Because wishing and hoping won't change a thing. For the 17 years I spent ricocheting up and down the scales, my main pastime was agonizing. I'd agonize about my weight; then I'd agonize about being a failure; then I'd agonize about my jeans size, my round face, my thunder thighs. It's not that I didn’t try every diet that came along - I did - but when each stopped working (and I started bingeing), I reverted to agonizing about what a failure I was. Since whatever you pay attention to flourishes, I became an expert in agonizing about my behavior rather than changing it. Finally, I decided to instead invest my time and energy in acting on a positive vision of myself - the sane, powerful me I sensed was waiting in the wings. Every day I would wake up and feel the pull to go back to what I had been doing before: dieting, bingeing, agonizing. And every day, I would tell myself that change was possible and that I was following a new plan; I was eating when I was hungry, stopping when I'd had enough, and keeping written track of my food intake, hunger levels, and feelings before and after I ate. After a few months of paying attention in this way, my relationship with food permanently changed. Not only did I lose weight, but I began to believe — because I experienced it directly — that I was worthy of self respect, and that left to my own devices, I would not chomp my way clear across the United States. In brain language, I'd been consistent and focused with my attention and I'd repeated the same new behaviors over and over; I'd given my brain a chance to develop new pathways, new habits. And I've never gone back. I am not special or unusual or lucky; the only difference between me and you is the time I spent on developing a new relationship with food. You can do this, too. Focus on a positive vision of yourself and decide on specific food-related actions you can take (ones that don't involve punishment, shame, or guilt) to enact that vision. For example, decide to eat only when you're hungry, putting away the book and turning off the television so you can focus on enjoying your food. Be consistent — and don't give up. No matter how many times you've tried and failed, no matter how desperate you feel in the moment or in the middle of the night, you can change. It isn't magic; it's neuroscience. It isn't luck; it's time spent. The answer is right here, right now; it's as close as your own heart and your brain. 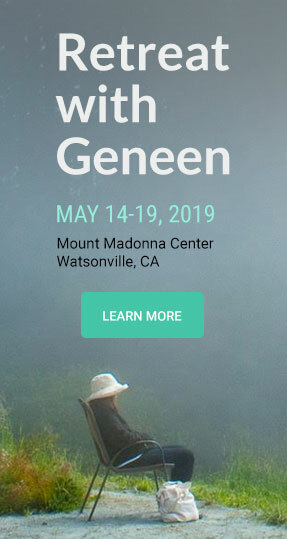 If you loved reading this article, think about joining me for my next retreat, May 14-19, 2019 at Mount Madonna Center, Watsonville, CA. Six days of constant support, endless kindness and ever present awareness. Learn the tools of inquiry, body sensing, meditation, and my Eating Guidelines, which are the basis of the journey. this blog today is very helpful to me as I’m just starting the journey of truly accepting the eating guidelines. When I follow them, I find this peaceful sort of wonder…’wow, I actually remember what I’m eating, feel how it tastes, there’s power in this.’ Then the next day I struggle with the Crazy Aunt in the Attic voice and the engraved patterns of decades. I needed to read this today to be able to embrace the peace and power that comes with actually eating when I’m hungry, paying attention to myself and the food while I eat and then stopping when I’m full. Wow. I want more of that so I plan to be consistent at achieving it.